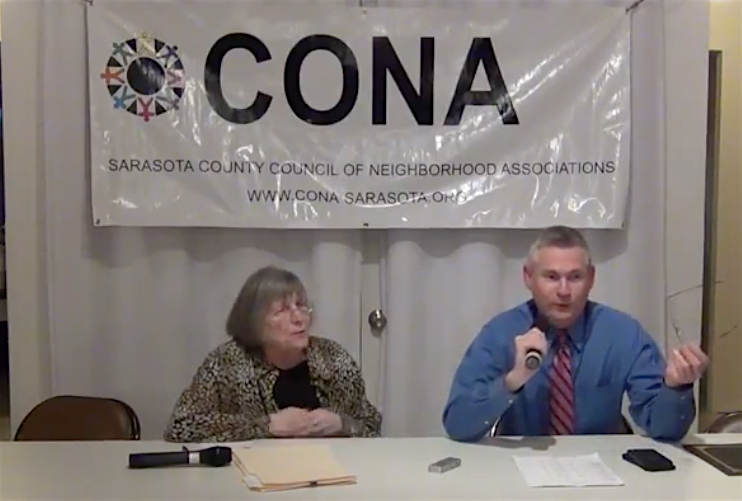 Sarasota County Supervisor of Elections Ron Turner had been invited to the Nov. 12 meeting of the Sarasota County Council of Neighborhood Associations (CONA) to talk about details of the Nov. 6 General Election — the precincts with the highest turnout, for example. Instead, much of his focus was on the statewide recount of the U.S. Senate, Florida governor and Florida agriculture commissioner races. The first set of unofficial vote totals went to the Florida Division of Elections on Friday afternoon, Nov. 9, Turner pointed out to the CONA audience. Turner’s staff beat the deadline of noon on Nov. 10, he said. The three members of the county’s Canvassing Board — County Judge Phyllis Galen; Nancy Detert, chair of the Sarasota County Commission; and Turner — began the recount process at 9 a.m. on Sunday, Nov. 11, Turner continued. It took them three hours, he said, just to test the voting equipment before the ballot-feeding process could begin. On Monday, he added, the board worked from 9 a.m. to 5 p.m., and he anticipated the same number of hours on Nov. 13. After the state has all the tallies from the supervisors of elections, Turner explained, Detzner will announce whether any of races still has a margin of victory of 0.25% or less. If so, then manual recounts will be undertaken in those races, Turner said. As for what a manual recount actually is, Turner pointed out that the Canvassing Board members will not take a look at every one of the 213,067 ballots cast in Sarasota County in the Nov. 6 General Election. Instead, he said, the board will review each ballot in which an “under vote” or an “over vote” was observed during the machine recounting. 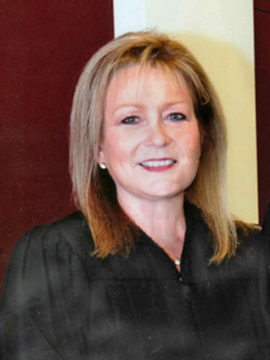 Those ballots already have been set aside in the event a manual recount is ordered, Turner noted. An over vote, he said, means that more than one oval was filled in for a race. An under vote means no oval was blackened. With each of the ballots in question, he continued, the Canvassing Board members would look at the remainder of the votes the person cast and try to determine the voter’s intent, if at all possible. According to the recount data Turner and his staff released later in the week, the machine recount found 1,848 under votes and 37 over votes in the U.S. Senate race. 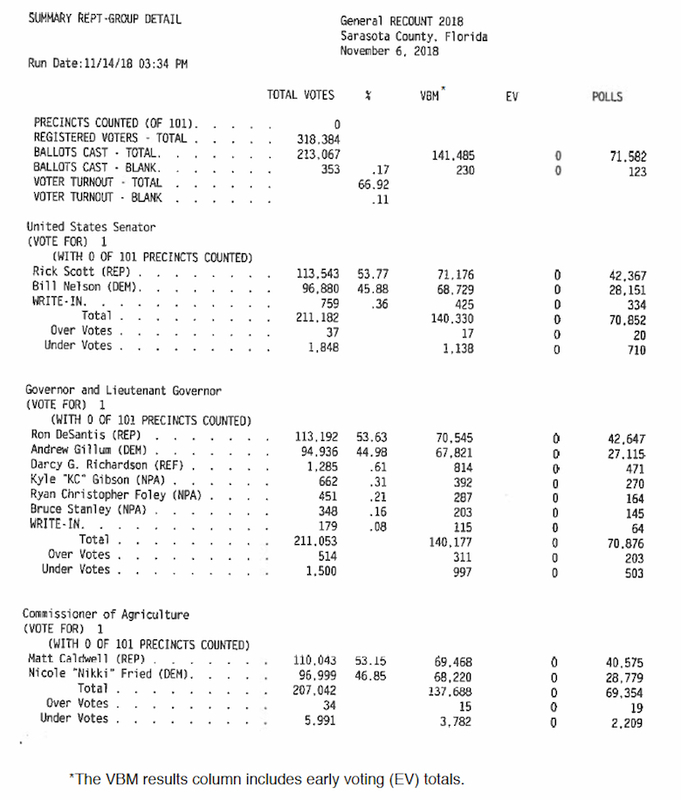 For the governor’s race, the over vote total was 514; for under votes, 1,500. In the commissioner of agriculture race, the over votes totaled 34, while the under votes added up to 5,991. During his opening remarks at the CONA meeting, conducted at the Sarasota Garden Club in downtown Sarasota, Turner noted that the county turnout for the Nov. 6 election was the highest for a gubernatorial election since 1994. Altogether — counting presidential elections, he said — the turnout was the largest in 38 years. Almost 67% of the 318,384 voters registered by the deadline of Oct. 9 cast ballots, Turner pointed out. 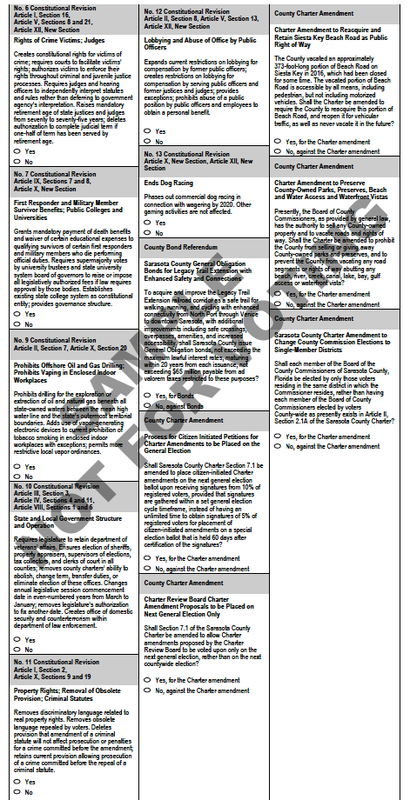 And the ballot, he said, was one of the longest in the county’s history: 17 inches in length and three columns in width, with races on the front and back. It included 12 proposed amendments to the Florida Constitution and six proposed amendments to the Sarasota County Charter, along with one City of Sarasota Charter measure and one for the City of North Port Charter, along with statewide and countywide races. His staff counted the largest number of vote-by-mail ballots ever, Turner continued — more than 82,000. Altogether, the county had 58,000 early voters, which was almost double the approximately 30,000 in the 2014 gubernatorial election cycle. On Election Day, Turner said, about 71,000 citizens went to the polls. “People listened to us,” Turner continued. “I’m glad I’m the supervisor of elections here. You can fill in the rest of that,” he added with a laugh, referring to Republicans’ allegations of improprieties at the Supervisor of Elections offices in Broward and Palm Beach counties. “I started in this business in 1994,” Turner explained. He was the DeSoto County supervisor of elections during the controversial presidential election of 2000, he added. Around the state, perhaps only half-a-dozen of the supervisors of election at that time are still working, he said. CONA President Kafi Benz praised Turner’s efforts to encourage people to vote, with regular news releases, interviews with the news media and a multitude of social media posts. “You have really impressed me,” she told him, which prompted a round of applause. In response to questions of CONA members, Turner explained that he had had to deal with misinformation that had been disseminated on social media ahead of the Nov. 6 election. For one example, someone criticized him and his staff, insisting that they had made it necessary for a voter to put extra postage on the vote-by-mail ballots. Yet, Turner said, the staff had made certain information was printed on those ballot packages in more than one place to make it clear that a single Forever stamp was all that was necessary to return the ballots. Turner also spoke about confusion that ensued about the deadline for the return of vote-by-mail ballots. They were due by 7 p.m. on Election Day. 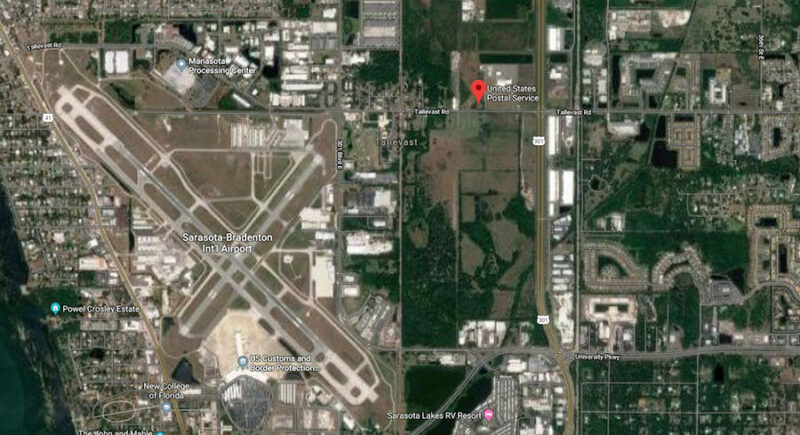 In fact, he explained, he had worked with U.S. Post Service officials so he could send employees to the mail collection center on Tallevast Road in Sarasota to collect all ballots arriving there with the 6 p.m. loads for sorting on Election Day. Therefore, he noted, his staff was able to collect all the vote-by-mail ballots that evening and add them into the total count. Otherwise, he pointed out, those ballots would have arrived after the 7 p.m. deadline. As for provisional ballots, Turner said his staff counted a total of 435 and accepted 205 of them. With a provisional ballot, he added, no “cure” is provided for someone in regard to a signature. Misinformation also had been spread about that process, he pointed out. Only with vote-by-mail ballots, he said, does the law allow a voter an opportunity to provide an updated signature if the initial signature does not match the one on file. The majority of the provisional ballots his staff rejected, he said, were filled out by voters who registered after the Oct. 9 deadline for the Nov. 6 election or by people who were not registered to vote. At the end of his remarks, Turner told CONA President Benz that he would be happy to come to another meeting to provide the type of information originally planned to be the focus of his Nov. 12 presentation.